This is gaming news for April 10 to 14. I busted up my knee pretty badly last Sunday and missed most of this week. Luckily video game news seems to have taken the week off also, and so this'll still be a relatively short wrap-up. Some good tidbits, though. EVE Online players have started scouting for real-world exoplanets, Star Wars Battlefront II gets its first (leaked) trailer, Bandai-Namco invites you to "Dine in Hell," Dawn of War III shows off its campaign intro, and Oculus asks for another trial in the ongoing ZeniMax dispute. The latest Humble Bundle focuses on space games—Galactic Civilizations III, Offworld Trading Company, Sins of a Solar Empire. But even cooler: You can snag a copy of the original Galactic Civilizations for free. All you need is a Steam account linked to your Humble account, then head to this page, fill in your email, and you'll get a Steam code. The bad news: scattered reports that the game's not working on certain modern systems, which would render your code useless. But hey, it's free. Might as well try. Speaking of Offworld Trading Company: The capitalism-centric strategy game is getting an expansion, set on Jupiter. Or rather, Io, one of Jupiter's moons. Star Wars Battlefront II is coming later this year—you know, the new Battlefront II, not to be mistaken for the original Battlefront II released in 2005. Anyway, a trailer apparently leaked this week ahead of the weekend's Star Wars Celebration. 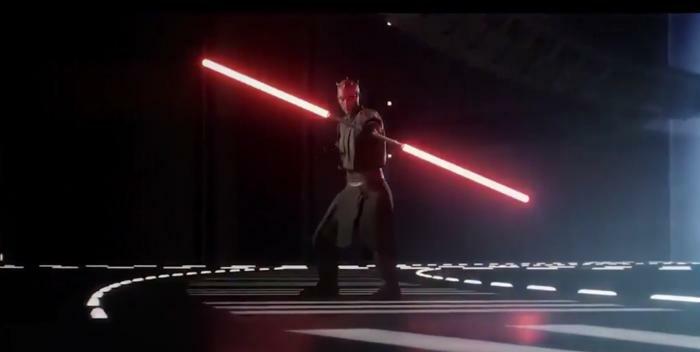 Darth Maul is in it, so I guess Prequel-era maps are confirmed. Also there's a space battle, which seems like foreshadowing? Maybe? Hopefully this game fares better than the last. Mirror embedded below. I don't usually use this space to recap new releases but this week, with absolutely zero warning or fanfare, Platinum dumped Bayonetta on Steam. It took almost eight years for some reason, but hey, I'm not complaining. Bayonetta is still an excellent action game, and looks great at proper PC resolutions and frame rates. Fingers crossed we get the WiiU-exclusive sequel soon too. Bandai-Namco's teasing a new game announcement for April 20, releasing the animated short below and ending it on the presumably tongue-in-cheek "Prepare to Dine" tagline. Whether it's actually related to the Souls games or just imitating the iconic slogan to score Bandai-Namco marketing points, I guess we'll find out next week. Stylish teaser, regardless. Also on April 20: The release of that Rick and Morty VR game from Job Simulator devs Owlchemy Labs. Dubbed Rick and Morty: Virtual Rick-ality, the demo session I played last year definitely felt like Job Simulator reskinned. Personally I have no problem with that—Job Simulator's still one of the best drop-in-and-play VR experiences, even a year after launch. More of that, but with dumb Rick and Morty jokes? Sold. More Quake Champions. This guy's a big red robot. Moving over to that other hero-based shooter, Overwatch kicked off its latest seasonal event this week. Dubbed "Overwatch Uprising," it consists of a custom PvE/horde-style mission, plus the usual limited-edition skins, emotes, and the like. At the very least, it's an interesting look at what an Overwatch singleplayer campaign might've looked like. Dawn of War III is approximately two weeks out from release, which means it's just about time for us to get a good look at the campaign. Or rather, the campaign's opening cinematic, below. It's…surprisingly restrained for a campaign opener. The conflict goes on and on and on, as this week UploadVR reported that Oculus is seeking a "new trial" against ZeniMax over the origin of its Rift VR headset. Oculus claims the $500 million in damages awarded to ZeniMax was "excessive" and that the jury's verdict was "irreconcilably inconsistent," that "spoliation testimony and adverse inference instruction tainted the jury." Look for a resolution to all this fighting sometime in…like, ten years or so? We opened on space news, might as well close on it too. One of the coolest stories to come out of EVE Online in the last few years was "Project Discovery," an initiative that crowdsourced EVE players to look through photos and identify human proteins, rewarding participants with in-game items while helping advance real-world science. It's happening again, though this time with a more thematically relevant subject. At EVE's annual Fanfest event last week, CCP expanded on the next stage of Project Discovery. This time players will be helping out a different sect of scientists, sifting through photos from the Kepler space telescope to try and find evidence of heretofore unknown exoplanets. Maybe one day humanity will travel to a planet discovered by EVE players. Pretty crazy to think about.